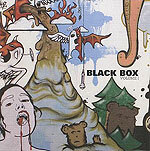 CD review: "Black Box Volume 1"
This review first appeared in the January 10, 2007 issue of the North County Times. A compilation taken from bands that have recorded in San Diego's Black Box Recording Studio (in Golden Hill, just east of downtown), this disc is as decent an overview of the local punk and alt-rock scene as it is a promotional vehicle for the studio. Taking in both established local bands, such as Transfer, Modern Rifles and The Jade Shader, and others that are still carving out a reputation, such as Swim Party and Fever Sleeves, "Black Box Volume 1" shows that San Diego is brimming with talent. Overflowing, actually. Even accounting for the fact that each track here is obviously among that band's best songs, there still isn't a dog to be found in the 17 songs. As this is basically a marketing tool for a recording studio, the sound quality is stellar, the mixes perfect.